The first full-colour guidebook introducing backcountry cyclists to the exciting and increasingly popular world of bikepacking. On the morning of June 13, 2008, seventeen amateur cyclists converged on the YWCA in Banff, Alberta, for the inaugural grand départ of the Tour Divide. They had committed to race 4418 km unsupported along the Great Divide Mountain Bike Route, the longest off-road trail in the world. Their path would take them up and over 200,000 feet, across the Crown of the Continent, down forgotten forest service roads, all to way to a remote desert crossing at Antelope Wells, New Mexico. The event has since become an international lightning rod for a new niche of cycle touring known as “bikepacking,” which is best described as the union of mountain biking and backpacking. Compared to asphalt touring, bikepackers traditionally operate in the backcountry, carry lighter loads and find solace in a more holistic approach to two-wheel travel: scouting their own routes, developing DIY gear projects and taking part in underground events like the Tour Divide. 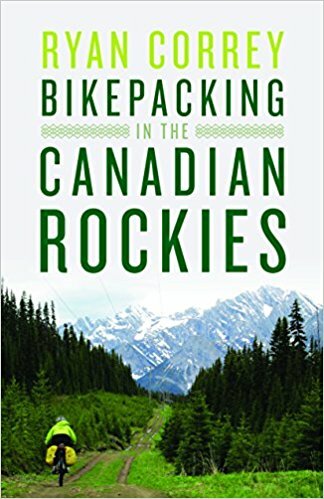 Follow along as veteran rider Ryan Correy (two-time finisher of the Tour Divide, founder of Bikepack Canada and author of A Purpose Ridden) rides into the most popular national parks in the Canadian Rockies: Waterton, Kananaskis, Banff, Kootenay, Yoho and Jasper. The result is ten ambitious, multi-day routes complete with directional cues, detailed maps, a helpful Bikepacking 101 section, rich photography and personal stories that will stoke the curiosity of both the beginner and experienced backcountry rider.